International BreastFeeding Centre / Information Sheets / Breastfeed a Toddler – Why on Earth? Breastfeed a Toddler – Why on Earth? Now that more and more parents are breastfeeding their babies, more and more are also finding that they enjoy breastfeeding enough to want to continue longer than the usual few months they initially thought they would. The World Health Organization and UNICEF has long encouraged breastfeeding for two years and longer, and the American Academy of Pediatrics is now on record as encouraging breastfeeding for at least one year and thereafter for as long after as the parent and baby desire. Even the Canadian Paediatric Society, in its latest feeding statement acknowledges that the parent may want to breastfeed for two years or longer and Health Canada has put out a statement similar to the WHO andUNICEF’s. 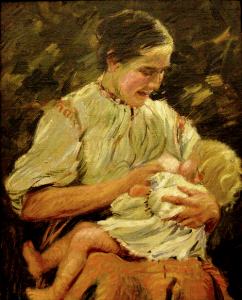 Breastfeeding to 3 and 4 years of age has been common in much of the world until recently in human history, and it is still common in many societies for toddlers to breastfeed. Because breastfeeding parents and babies often enjoy breastfeeding a lot. Why stop an enjoyable relationship? And continued breastfeeding is good for the health and welfare of both the parent and child. Perhaps this is said, but it is patently wrong. That anyone (including paediatricians) can say such a thing only shows how ill-informed so many people (including pediatricians) in our society are about breastfeeding. Breastmilk is, after all, milk. Even after six months, it still contains protein, fat, and other nutritionally important and appropriate elements which babies and children need. Breastmilk still contains immunologic factors that help protect the child even if he is 2 or older. In fact, some immune factors in breastmilk that protect the baby against infection are present in greater amounts in the second year of life than in the first. This is, of course as it should be, since children older than a year are generally exposed to more infections than young babies who too often are kept cloistered. Breastmilk still contains special growth factors that help the immune system to mature, and which help the brain, gut, and other organs to develop and mature. It has been well shown that children in daycare who are still breastfeeding have far fewer and less severe infections than the children who are not breastfeeding. The breastfeeding parent thus loses less work time if breastfeeding is continued once returning to paid work. It is interesting that formula company marketing pushes the use of formula (a very poor copy of breastmilk) for a year and now for 3 years(! ), yet implies that breastmilk (which formula tries unsuccessfully to copy) is only worthwhile for 6 months or even less (“the best nutrition for newborns”). Too many health professionals have taken up the refrain. This is also untrue; in fact, this is absurd. It is unbelievable how so many people in our society twist around the advantages of breastfeeding and turn them into disadvantages. We give babies immunizations so that they are able to defend themselves against the real infection. Breastmilk also helps the baby to fight off infections. When the baby fights off these infections, he becomes immune. Naturally. And breastfeeding makes the toddler dependent? Don’t believe it. The child who breastfeeds until he weans himself (usually from 2 to 4 years), is usually more independent, and, perhaps, more importantly, more secure in his independence. He has received comfort and security from the breast, until he is ready to make the step himself to stop. And when a child makes that step himself, he knows he has achieved something, he knows he has moved ahead. It is a milestone in his life of which he is proud. Often we push children to become ‘independent” too quickly. To sleep alone too soon, to wean from the breast too soon, to do without their parents too soon, to do everything too soon. Don’t push and the child will become independent soon enough. What’s the rush? Soon they will be leaving home! You will be amazed how quickly the time goes by and you are seeing your “baby” off to university. If a need is met, it goes away. If a need is unmet (such as the need to breastfeed and be close to his parent), it remains a need well into childhood and even the teenage years. Of course, breastfeeding can, in some situations, be used to foster an over-dependent relationship. But so can food or toilet training. The problem is not the breastfeeding. This is another issue. Possibly the most important aspect of breastfeeding a toddler is not the nutritional or immunologic benefits, important as they are. I believe the most important aspect of breastfeeding a toddler is the special relationship between child and his parent. Breastfeeding is a life-affirming act of love that repeats itself every time the child goes to the breast. This continues when the baby becomes a toddler. Anyone without prejudices, who has ever observed an older baby or toddler breastfeeding can testify that there is something special, something far beyond food, going on. A toddler will sometimes spontaneously, for no obvious reason, break into laughter while he is breastfeeding. His delight in the breast goes far beyond a source of food. And for the breastfeeding parent, breastfeeding becomes a source of delight as well, far beyond the pleasure of providing food. Of course, it’s not always great, but what is? And when it is, it makes it all so worthwhile. And if the child does become ill or gets hurt (and they do as they meet other children and become more daring), what easier way to comfort the child than breastfeeding? I remember nights in the emergency department when parents would walk their ill, non-breastfeeding babies or toddlers up and down the halls trying, often unsuccessfully, to console them, while the breastfeeding parents were sitting quietly with their comforted, if not necessarily happy, babies at the breast. The parent comforts the sick child with breastfeeding and the child comforts the parent by breastfeeding.